Registration opened today (January 11) for the 2019 Miles for Myeloma 5K Walk/Run. This year's event will be held on Saturday April 27 at the Please Touch Museum in Philadelphia. The Miles for Myeloma 5K is the PMMNG's annual major fundraising event. Money raised through the event is donated to the International Myeloma Foundation, which in turn uses the money to fund research toward a cure for multiple myeloma. You can find more information about the 2019 Miles for Myeloma 5K Walk/Run in the Powerpoint slides below and / or by going to the Miles for Myeloma menu item in our menu bar at the top of this page. The Philadelphia Multiple Myeloma Networking Group’s (PMMNG) mission is to be an ongoing resource for myeloma patients, their families and friends. Provide hope to the Myeloma community through education, companionship, compassion, and advocacy while working toward a cure. Open pathways for patients seeking treatment by building and sustaining relationships with area medical centers, national myeloma organizations and pharmaceutical companies. The PMMNG was formed in 1995, and is a diverse group of myeloma patients, their caregivers and support persons. 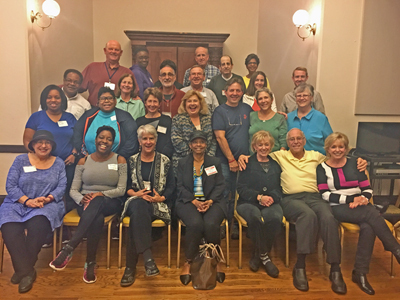 From an original meeting around a kitchen table, the founding members led the organization to find more appropriate meeting space, an experienced group facilitator and many more members. Phil Falkowitz and his wife, Barbara, along with Marilyn Alexander and her twin sister, Sharon, mobilized efforts to include patient education, political advocacy and fundraising for Myeloma research. Meeting notices spread throughout the Philadelphia region and relationships with local cancer organizations were established. In 1999, the growing group found its current home at the Ralston House. The membership list grew to upwards of 300 members. At present, the PMMNG is affiliated with the International Myeloma Foundation (IMF). The PMMNG is led by a Steering Committee and is known in the region as a safe haven for families dealing with myeloma. Certainly we wish there were no need for a group such as ours, but we take comfort from the fact that we have been able to reach and assist so many more people than the small group who met more than 20 years ago.